He's just 17 but has had a phenomenal run so far in his very short career. Should he be given a chance to play for India now itself? Since he's an opener, does it mean he comes in place of Murali Vijay? Raja, before Prithvi Shreyas Iyer should play. He scored a double hundred against visiting Australians also did very well against NZ A. He has been knocking on the door for last 3 years. Shardul Thakur and Dhawal Kulkarni destroyed the Odisha batting yesterday. Shreyas Iyer is not captaining as he is on India duty. Aditya Tare is leading the Mumbai side. I think Raja is right here. This 17 year old youngster Shaw could be an India prospect if he keeps his feet on the ground. Prithvi Shaw and a few other U-19 players have played first class cricket and they are being thought highly of. Today, Prithvi Shaw is leading U-19 team against Australia in U-19 world cup. Indians batted first and scored 328. When Indians bowled, I was epecting Indian pacers to bowl at around 128 kmph mark, like australian pacers. But guess what, Shivam Mavi, who opened the bowling started bowling over 140 knph, with a peak speed of 144 kmph. Later, Nagarkoti came at one change, and he began bowling at over 140 kmph too, and his fastest delivery was 147 kmph ! When I checked their profile, I find that they have not yet played first class, despite being able to bowl faster than pacers who are in the Indian team. They looked in a different league altogether compared to Porel, another pacer who plays Ranji for Bangal and Saurav Ganguly has high opinion of him. I am very excited with these two pacers. Here is hoping that people with take notice of their bowling. Prithvi Shaw is a member of Mumbai Ranji side.He has been fast tracked keeping in mind future prospects. I am talking about Mavi and Nagarkoti not being in any Ranji team despite being faster than the pacers who represent BCCI in international matches. Hopefully these two will catch the eyes of their state selectors (UP and Rajasthan respectively) from next season. Yes, pleasantly surprised by Mavi and Nagarkoti bowling 140 kmph plus. There was a time when Prithvi Shaw did the over-an-hour long local train journey from Bandra to Bhayandar on his father Pankaj’s shoulders. It was the only way he could avoid getting crushed in the peak hour frenzy of a Churchgate-Virar fast train in Mumbai. Only when the crowd thinned in the compartment did Pankaj put his son down, followed by a quick check on Prithvi’s cricket kit, making sure it was still intact. With a nonchalant shrug, Pankaj remembers that incident amid the construction mess at what will be their new home on Juhu Tara Road. The family plan to move in once Prithvi returns from his latest assignment as captain of the India team at the ICC Under-19 World Cup in New Zealand. India play their first match against the Australian U-19 side today. The apartment, offered by Indian Oil, is just one of the perks Pankaj enjoys these days in return for years of graft. It is a far cry from the years of long commutes and distant suburban living. “Us time pe aur koi chara nahin tha (There was no other way out at that time),” Pankaj says, as he recalls the days when they made the journey from Virar to various cricket grounds in the city. Those were hectic days. While Prithvi caught up on that extra hour of sleep every morning, Pankaj was up cooking his breakfast—either a simple fare of roti and aloo ki sabzi or his favourite, anda ghotala. Once up, it was a maddening rush to get aboard a train from Virar. It was only when Prithvi had made it to the ground that Pankaj breathed easy. While Prithvi slogged it out in the middle under the scorching Mumbai sun, Pankaj would spend the rest of the day watching him from under the shade of a tree on the periphery. It was during one such blazing afternoon about eight years ago that this writer first met Pankaj. Once the session was over, it was time once again for a long train ride, now homewards. It wasn’t an easy proposition killing time on the dusty maidans, but Pankaj was well aware of what he had signed up for. Ever since a three-year-old Prithvi began smashing little plastic mock cricket balls all over, Pankaj had decided to put his life on the back burner. “Prithvi is the greatest gift given to me by God and his mother. Once she passed away (when Prithvi was 4), there was a void that needed to be filled. There was nothing else but cricket in our lives there on,” Pankaj says. At a time when his garment business had just picked up—he used to source it from wholesalers and sell it in Surat and Baroda—Pankaj gave it all up. For the next three years, the duo survived on his meagre savings. Every once in a while someone helped out with the bare necessities—both on and off the pitch. It wasn’t until much later that Prithvi started receiving scholarships to ease the financial pressure. They also found a supporter in Shiv Sena MLA Sanjay Potnis, who, in 2009, handed them a home in Vakola, a short distance from Prithvi’s training ground in Bandra. “All of a sudden we had time—to rest, to think of other things, to bring about some order in our daily life. And to breathe,” Pankaj says. There was no let up on the cricket though. The time earned was mostly dedicated to more hours in the nets. When the regular bowlers tired, Pankaj took on their job, bowling for hours at the Air India ground in Kalina to help Prithvi hone his skills. “Mujhe batsman banne ka mauka kabhi mila hi nahin (I never had the opportunity to become a batsman),” he says, breaking into a smile. With no background in the sport, it was the least Pankaj could do to help his son on the field. This was at a time when Prithvi was turning out for Rizvi Springfield—a team that has dominated school cricket in Mumbai for years. He studied in the school from the third to the 10th standard and is currently in Rizvi College. Back then, the Rizvi school team also featured the likes of Arman Jaffer (former international batsman Wasim Jaffer’s nephew) and Sarfaraz Khan, both of whom came from cricketing families. In addition to coping with the new ball as an opener, Prithvi also had to deal with these two breathing down his neck, eager to get to the crease and equally hungry for runs. Sarfaraz has already played the last few seasons in the Indian Premier League for Royal Challengers Bangalore. There was little need then for the three boys to go looking for competition elsewhere. For instance, Sarfaraz’s mark of 439 in a Harris Shield tie in 2009 was bettered by Arman’s 498 the following year. As if to prove a point, Prithvi rewrote the record books with a 546 in 2013. While basking in success was one thing, Prithvi also realised what it meant to fail in those early days. It was then a nerve-wracking experience, his father recalls, to simply be around him when he got out early. His face would be flush even before he left the ground, and after getting the gear off, he would find a tree and sit in silence, tears streaming down his cheeks. No amount of coaxing would appease him, there was no question of eating a meal or even drinking water, and it was only Pankaj’s stern demeanour that would eventually extract some reaction from the crestfallen boy. “He realized the importance of his wicket early on and how he needed to be patient, despite his aggressive approach to batting. It’s a lesson that has served him well today,” Pankaj says. During those early days, his height was another cause for worry—he’s around 5’7’’ today—especially when it came to finding equipment. Pankaj spent hours wandering around the sports shops in Dhobi Talao, hoping to find shoes that fit him or a helmet that would make him look like a batsman, instead of an astronaut. The pair tried everything from swimming and cycling to several medical interventions, until Pankaj decided to let nature take its course. “It was a task to find anything his size. There were times I’ve taken pads, cut them to size and stitched them again so that he could wear it during a game. But most times, he had to simply make do with oversized gear,” Pankaj says. This was never an excuse, though, when it came to his game. And Pankaj attributes it to a disciplined regime. While there was always time for an extra hour in the nets or late evenings attending tuition classes, the lights at home were out by 9.30pm for an early start the next day. In all these years, the two never have never taken a vacation; celebrations after a good performance involved a quiet Chinese dinner, Prithvi’s favourite. Most bonding between the father and son happens over a meal, or while sharing a laugh as they watched television show, Taarak Mehta ka Ooltah Chashmah. On occasions, when he needed time off cricket, they would make a trip to Virar, where Prithvi would relive the days from the past over a game of underarm cricket with local boys. Not much has changed even today. “I’ll admit I’ve been a strict father at times. This was what was needed to get here and this is what is needed to continue the progress,” Pankaj says. Over the last few years, the Shaws have been rewarded for the grind, though there has been little change in Pankaj’s stoic demeanour. These days, he has some time to himself, as the endless shuttles to the maidans have reduced drastically. Pankaj enjoys most of his son’s outstation performances on television these days. Sessions are followed by a quick phone call to check if Prithvi is eating well and sleeping on time. Though he has blossomed into a mature adult at 18 years, Prithvi remains his father’s little boy even today. Like Virat Kohli said in 2011, in a different context, from the days of being carried on his father’s shoulders, Prithvi will shoulder the expectations of an entire nation come Sunday. Shail Desai is a Mumbai-based writer. Wanted to bump Raja's thread. Shaw has struggled in his life to get where he is. His father brought him singlehandedly after his mother's demise at the age of 4. His father even sold his shop to support his son's cricket. He is one amongst a bunch of exciting prospects for India - some of them could play in the BCCI senior team soon. I think at least some players of the senior team will be feeling the heat. No place is secure anymore - except possibly Kohli's. That's a good thing - will make players raise their game. I think Shubman Gill looks more talented. Kohli 2.0. He will be a superstar. Prithvi will also make it big. I also feel that Shubhman Gill looks a better batsman. Is he better than Mayank Agrawal ? I feel Sorry for Mayank Agrawal who has been knocking at the door for much longer period. squarecut wrote: Is he better than Mayank Agrawal ? I feel Sorry for Mayank Agrawal who has been knocking at the door for much longer period. Prithvi is the next Tendulkar/Kohli. Mayank is a decent batsman, who can get loads of runs on good batting wickets. Prithvi is one of the finest to step on a cricket field. 100 on debut for Prithvi Shaw. Opposition weak and on flat track, so too early to say anything. Hopefully he will do well. ASTARISBORN today. BCCI got a reliable opener ? love it that he put fire under collective asses of murali vijay, KL rahul, dhawan & rohit. oh he sure is envy of other cricket boards with opener issues as he offer long term solution too considering his age. "Prithvi Shaw: Feeling really good now, after the hundred. I was a bit nervous to start off but when I got in, I got comfortable. I just tried to play my natural game. I was just thinking that it's another game for me and then it just happened. I played the balls on merit and kept going from there on. I was thinking about my Dad, as he has sacrificed a lot for me. First hundred, it's all for him. Playing for India, it was a big thing for me. I wanted to make this chance count. It was a good challenge for me and I think I did well in front of these guys. From the smaller age I used to play a lot of school cricket, 30 or 35 school games in a year. I have played a lot of cricket in Ranji and it just keeps going on with so much cricket around. All that experience has helped me and I played my game accordingly. The wicket was good and I should have kept batting. I should have been a bit careful as there were only 10 minutes left before tea." The look on his face when he got out! Clearly he wanted to keep going - there were plenty of runs there for the asking. Indeed, a star is born. This is quite the start to a career. Will be the next Kambli or Tendulkar? Both of whom starting with similar pizzazz where one become a superstar and one became less so. This really is the perfect time to blood new talent. Playing a weak WI team in India, then a tour away to Australia. These guys will be well seasoned before entering the perils of England and SA. Paddles wrote: This is quite the start to a career. Indeed, he seems to be maturing like a dream. He was Indian U-19 captain just eight months ago and now he finds himself fast tracked into test cricket, no less. He is still eligible to play U-19 cricket. If skipper Kohli felt that he deserved to get a look in ahead of the other opener, then it means that he must have seen something special in Shaw. It would be good if people left him alone instead of putting pressure on him by hyping him and comparing him with past legends , predicting big things about him etc. There can be many slips between the cup and the lip. One should just take it one match at a time. Earlier in the thread, I talked about two U-19 players generating pace of 140kmph plus in U-19 world cup, who had not played senior cricket till then. Shivam Mavi, one of those two pacers, made his List A debut a few days ago for UP in Vijay Hazare trophy against Saurashtra. He claimed a hattrick on debut, cleaning up three batsmen on consecutive deliveries with raw pace. His victims were-Chirag Jani, Arpit Banswada and Jaidev Unadkat. Kambli lost his way becoming a drunkard and a womanizer. Tendulkar kept his feet on the ground, he knew where he came from. 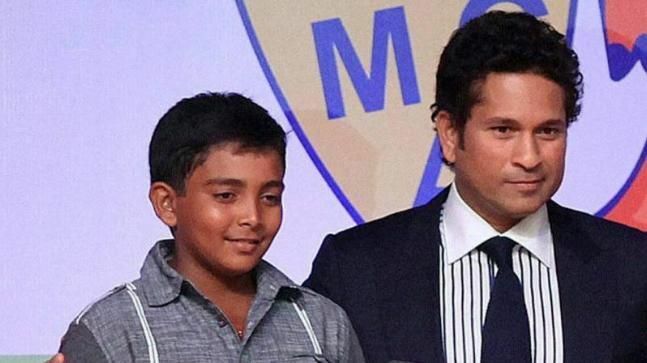 Both were coached by the same person, Achrekar, who considered Kambli more talented than Tendulkar at school level. We had a good thread on that Paddles. I remember you discussed his problem with the short ball. As long as the willingness to learn is there, I would give Shaw pass marks. There will be plenty of challenges, how one navigates them is important. It was February of 2018. The India U-19 team had just won a record fourth World Cup title beating Australia by eight wickets in New Zealand. Meanwhile, back in India, Mumbai was gearing up for a Vijay Hazare clash against Tamil Nadu in Chennai. Outside Crowne Plaza, the standard port of call for the visiting Mumbai squad, a sturdy boy, dressed in black shorts and grey jersey, stealthily walked through the exit gate - virtually unnoticed - desperately trying to cover his face. And it wasn't until after he had crossed the street that his identity was revealed. Prithvi Shaw, the U-19 captain, was in town and was expected to open the innings with Jay Bista in the Hazare Trophy. While the diminutive opener could afford to walk freely on the streets of Mount Maunganui, at home, he had found that fame has its price. After all, he wasn't just another teenager frequenting the maidans of Mumbai anymore, he was the captain of the U-19 World Cup-winning Indian side. "I have followed his [Prithvi Shaw] progress closely and it is no surprise to me to see him where he currently is, it was always going to happen, and he will continue to improve," Julian Wood - former Hampshire opener - among the first few people to spot Shaw's talent, tells Sportstar. And as Shaw flayed the South Africa 'A' bowlers at the M. Chinnaswamy stadium in Bengaluru, scoring a 136 off 196 balls on Sunday, he made another rapid stride towards India contention. Wood, who runs the Julian Wood Cricket Academy (JWCA) in Bradfield, first saw Shaw at the tender age of eight. "The first thing I noticed was his size, very small though stocky in build. His technique was perfect, very pure, looked like a man playing in a boy's body. The way he hit the ball was different to anyone I’d seen at that age, with real punch," the power-hitting coach says. "He played in a U-14 match for the MIG CC vs JWCA. He scored 74, something special was formed that day, a day that one will always remember!" he adds. The right-handed batsman was in fine touch at the U-19 World Cup, making two half-centuries — 94 and 57 not out — and a couple of 40s in seaming and swinging conditions. But Wood remembers his young protege's early struggles with the moving ball. "When he came to the UK, he trained at the Academy and played Premier League cricket. He performed well in the matches but had a tendency to struggle against the movement and bounce of the English pitches causing him to get caught behind often. This was something that we looked at and trained hard at the Academy," he points out. At 18, Shaw has already brushed shoulders with the elites of the game. Playing for the Delhi Daredevils - which lapped him up for Rs. 1.2 crore - Shaw plied his trade alongside the likes of Gautam Gambhir, Glenn Maxwell and Jason Roy. Playing with cricketers - some of whom are twice his age - isn't a new thing for Shaw. "He was 13 years old when he played county 2nd XI for Gloucestershire (which is unheard of in the UK)," Wood says before adding, "He would bat with county players five years older than him and you would find them asking Prithvi about playing spin etc. His knowledge of the game was phenomenal!" Shaw first shot to fame as a 14-year old when he plundered 546 off 330 balls, scoring a staggering 85 boundaries and five sixes, for Rizvi Springfield in the Harris Shield tournament. He even managed to break the great Sachin Tendulkar's record in 2017. Aged 17, he became the youngest player to score a century on his Duleep Trophy debut. Wood, who has previously worked with England internationals Joe Root, Alex Hales, Sam Billings, Jonny Bairstow and Ben Stokes knew, from the time he took Shaw under his wings, that he was dealing with something special. "I believe the nature of the modern game dictates the way you have to play. He will learn as he goes on. "I will continue to follow his progress and, who knows, one day do some more work with him within the T20 Franchises. "The modern game is an entertainment business, and he’s definitely entertaining!" Oh he definitely has pass marks right now and then some. This is a freakish career start. But - India needs batsmen who score runs in England and SA to win. Kohli, as excellent as he is, is not enough on his own. Those long, crushing train commutes from far flung suburbs to the maidans of Mumbai finally paid off for Prithvi Shaw when he became the youngest Indian to score a century on debut on Thursday. At 18 years and 329 days, Prithvi realised his dream of playing for India and impressed everyone with his positive approach during his innings of 134 (154 balls). One thing those who have seen him over the years playing cricket in Mumbai, vouch for is his fearless attitude and his natural instinct to play attacking cricket. “As an 18-year-old he has no baggage to carry. He has shown tremendous potential and is matured way beyond his years,” said former India captain, Dilip Vengsarkar, who was the Mumbai Cricket Association (MCA) vice-president when Prithvi broke into the Mumbai Ranji side last year. After his innings against the Caribbean outfit, Vengsarkar feels that he should be India’s first-choice opener when India tours Australia later this year and urged the MSK Prasad-led selection committee to show “faith in his ability”. Chandrakant Pandit, under whom Prithvi made his Mumbai debut, is happy with the fact that he hasn’t changed his approach. “What I liked about him was the way he was batting today. He used to bat in similar fashion when he was 12-13 year-old when I was the Director of the MCA Academy,” said Pandit, who guided Vidarbha to Ranji Trophy title last season. Samant, like Vengsarkar, is of the opinion that Prithvi will surely open for India against Australia. His school coach, Raju Pathak, remembers his early steps in the game. “His father had brought him to me when he was in the third standard. He was really short at that time and on first day he told me ‘I will face the big guys’. I told him to start with the smaller kids. But after watching him play a couple of balls, I sent him to face the bigger boys. I knew at that moment he was a special talent,” said the coach of Rizvi Springfield, Prithvi’s school. Rohit Brijnath on Prithvi Shaw. Do you see your reflection in Prithvi Shaw? First of all, Prithvi is a right-hander and he is more of a mix of Sachin Tendulkar and Virendra Sehwag. I remember when I was 18, I was not as powerful as he is. Also, the way we were accustomed to bat was very different back in those days. Prithvi strikes the ball very well and looks a very good player, very solid, somebody who has a great love and passion for the game. I see in him a great appetite to learn and that is the most important thing as no matter how much talent you possess, you must keep learning and he has that humbleness. I know he will keep improving.